Tie Clips, Watches and other items! Our FAQ !! Answers to all those questions. Visit our amazing document server. Quotes & SciFi to Ethics & Business. 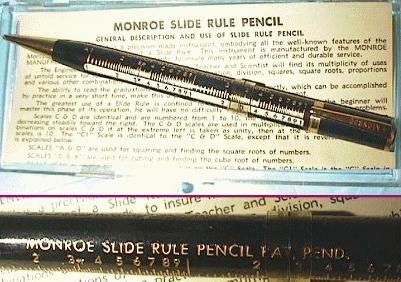 Not every slide rule is a lofty and significant piece of scientific equipment, some are just for fun, and some you wear one place or another. 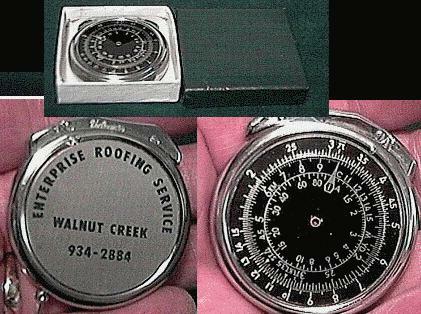 There are slide rule watches, cuff links, moneyclips, lighters, keychains, and tie clips. These items add some spice to the process of collecting that might otherwise get pretty stodgy and dry. Makers of this type of slide rule were usually makers of conventional items, who then decided to add a 'slide rule-ized' version to their line to interest engineers and similar techno-types. Watchmakers included Seiko, Pulsar, Breitling, Citizen and Selectron, and Breitling, Seiko and Citizen still make numerous slide rule models today, mainly for pilots and race car drivers. Slide Rule tie clips and cufflinks were made by Swank, and some additional makers that have been hard to identify, since the orignal packaging is now long lost for many of these items. 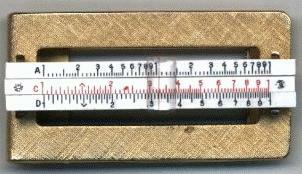 At least K+E, Pickett and probably other slide rule makers had custom tie clips made for them as promotional items, usally for their own sales staff. These are fairly rare items, and seldom seen. As we get pictures of these various items, they will get added into the archive for your pleasure. If you have pics or more information to provide, please send them to me HERE, and I will add them in. Thanks to many who have furnished pics to fill this archive, espeically Craig Kielhofer, who searched out many examples, and provided photos of all his own items. Gold metal tie clip, with enameled face, has working slide, magnifying cursor. Gold metal tie clip, with enameled face, has fixed slide, clear cursor. Gold metal tie clip, with plastic face, has working slide, no cursor. * 3 working scales, A, C, D.
Gold metal money clip, with plastic face, has working slide, and working, magnifying cursor. 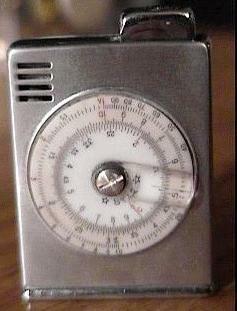 Stainless steel lighter with metal circular slide rule. Made by Vulcan. 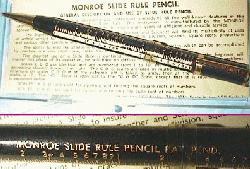 Stainless steel lighter with plastic circular slide rule. Made by Star. 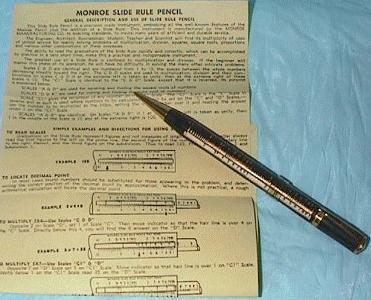 Gold tone lighter with metal circular slide rule. Unknown maker. Gold metal tie clip, with plastic face, has working slide, working, magnifying cursor. Nickle metal tie clip,, has working slide, clear cursor. * A staff item from K+E, very rare, highly detailed. Gold metal tie clip, with enameled face and logo, has fixed slide and 'Pickett logo' cursor. * A staff item from Pickett, very unusual. Gold metal tie clip,, has working slide, clear cursor. * 3 working scales, A, C, D. * Also in silver color. Gold metal tie clip,, has working slide and cursor on clip, fixed slide on cuff links. 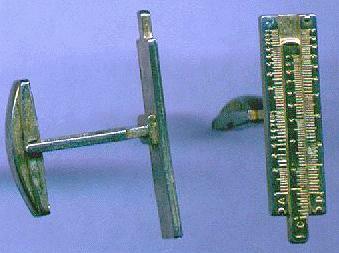 * 3 working scales on clip, A, C, D.
* Has matching set of cuff links. Gold metal tie clip,, has fixed slide, no cursor. * Has matching cuff links shown below. * Gold metal cuff links, has fixed slide, no cursor. 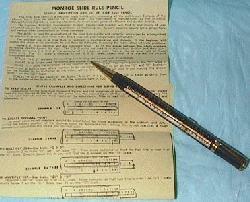 * 3 decorative scales, A, C, D.
* Mechanical pencil with sliding scale and cursor. * 3 scales, A, C, D.
* 2 scales, C, D.
* Pen with rotating color code bands. * 3 color bands, decodes standard EIA resistor values. 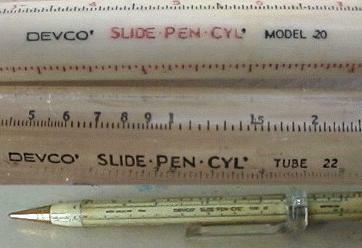 * Pen with internal scale tubes. * unknown total number of scales. 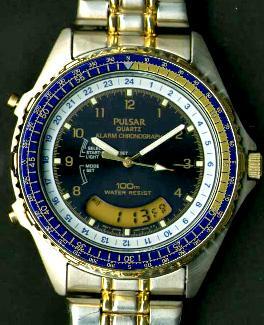 BLUE ANGEL FLIGHT CHRONOGRAPH ALARM. 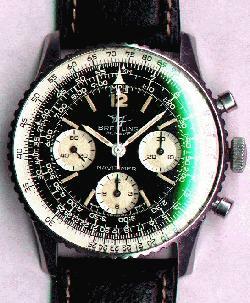 * Rotating slide-rule bezel, for speed, time, distance, fuel consumption, multiplication, division, proportion and square root. * Time and calendar in 22 world time zones. * retractable hands and display visibility. * Help display of button functions. * One-touch interchngeable Analog/digital times. * Three world time alarms. 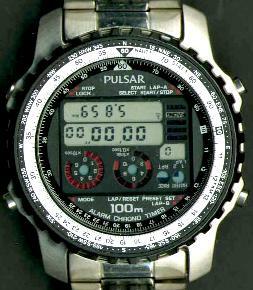 * 1/100 second Chronograph measures up to 24 hours. * 60 minute count down timer. * Safety clasp on stainless steel/2 tone bracelet. 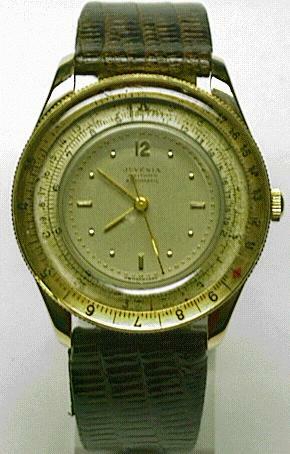 * 100 meter water resistant. * Stainless Steel housing and band. 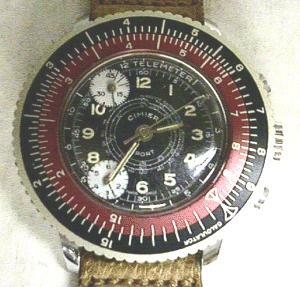 * Rotary slide rule bezel. * Leather band, steel housing. * Woven band, steel housing. * Leather band, gold housing. * Stainless steel band and housing. * Gold/stainless steel band and housing. * Analog watch face, with digital day/date. *Rotary slide rule bezel for conversions, multiplication, division, speed, distance, fuel consumption rate, conversions between nautical and statue miles and kilometers, U.S. gallons and liters, fuel pounds to U.S. gallons and Imperial gallons. 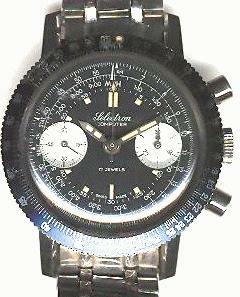 *Chronograph records elapsed time up to 6 hours in 1/5 seconds. *Water-Resistant to 150 Meters (450 feet). Site Design & contents copyright 1998, 1999, 2000, 2001, 2002, 2007, 2008, 2013 by Walter Shawlee 2 & the ad hoc Godzilla Graphics Group.